the 35 foot wide stone lifeguard tower is 200 feet above the ground. the 23 foot wide stone bridge is -40 feet in front of and -36 feet above the lifeguard tower. it is leaning 15 degrees to the front. 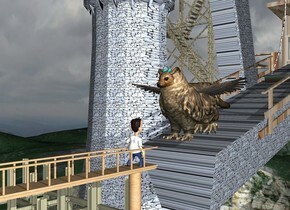 the 1st 8 foot tall owl is -41.5 feet above and -17 feet in front of the bridge. the 2nd 8 foot tall owl. the 2nd owl is leaning 40 degrees to the front. it is -9 feet above and -10 feet behind the 1st owl. the 16 foot wide goose is -11 feet above and -7 feet in front of the 2nd owl. it is leaning 20 degrees to the front. the 6 foot tall marten is -14.9 feet in front of and -5.9 feet above the 1st owl. two 1 foot tall cyan artichokes are -1.03 feet above and -1.3 feet in front of the 1st owl. wooden catwalk is -4 feet in front of and -44 feet above the bridge. it is facing left. a wooden pillar is -3 feet behind and 0 feet below the catwalk. a boy is -3 feet behind and -2 feet above the catwalk. he is facing the 1st owl. the boy's shirt is white. the sky is cloudy. it is morning. the 1st stone tower is 5 feet left of and -70 feet below the bridge. the 2nd stone tower is 3 feet behind and -74 feet below the 1st tower. it is 50 feet tall. it is facing left. the 17 foot tall stone construction site is 3 feet left of and 2 feet below the catwalk.